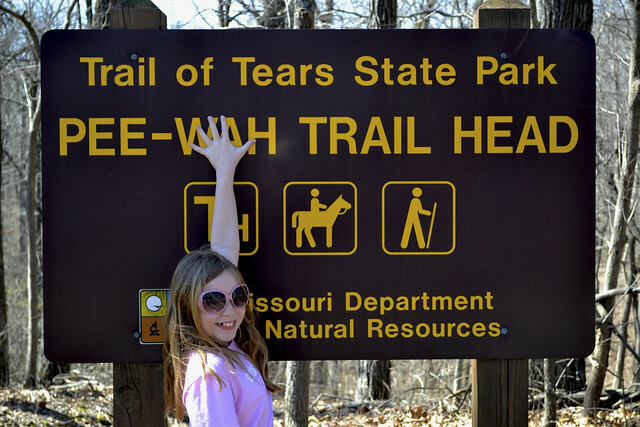 After experiencing the beauty of Trail of Tears State Park while exploring the three mile Sheppard's Point Trail, we knew that our family would be heading back soon, this time to tackle a more "formidable" foe... The nine mile long Peewah Trail. Now, I say that the Peewah Trail is ten miles, and it is, but the beauty of this trail is that it is split into two completely different trails with two seperate trail heads, that forms a full on (if a bit askew) figure eight. These two sections of the Peewah Trail are simply referred to as the East Loop and the West Loop. The East Loop: The East Loop is approximately 3.25 miles long and is easily identified by its yellow blazes. This loop climbs the ridges and bluffs that overlook the Mississippi to the East and even features a small spur that will take you out to a scenic overlook (located 1.5 miles East of the trail head for the East Loop) so that you can get a beautifully clear picture of the Mighty Mississippi, in fact, if you find that the scenic overlooks just off the roadside are full, this viewpoint and the vantage at Sheppard's Point are excellent alternatives, and all but guaranteed to be less crowded during Bald Eagle season. This trail is a perfect example of what goes up, must come down. As you follow the bluffs and ridges along the Mississippi eventually you'll come to the descent into the bottom-land, filled with wildflowers (in the spring/summer), giant cane and even a few creek crossings. Of course, with the creek crossings the possibility of washouts and flooding are a possibility depending upon the level of the Mississippi, so pay attention and use caution during any creek crossing. As you are on the Western side of the loop, keep an eye out for the black and white blaze, indicating the connector between the East Loop and the West Loop. from the 2003 tornado damage. The West Loop: To access the 5.75 mile long West Loop, you may hit the trail head, located along the Overlook Road, just north of Hill Road or you can hit the connector from the East Loop, mentioned above. 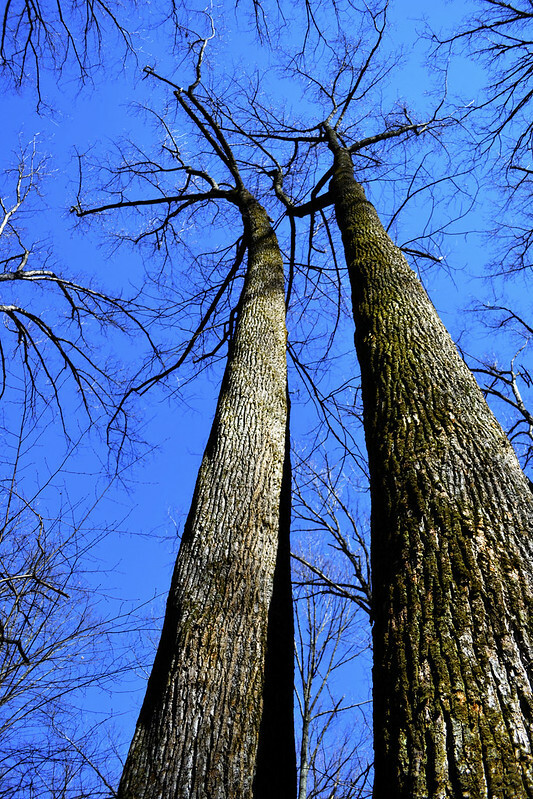 As you hike through the region, marked clearly with red blazes, you will notice areas with beautiful oaks and hickories lining the ridgetops, while sweet gum and sycamore dominate the bottom-lands, with a health amount of native ferns thrown in just for measure. While taking in the beauty of these trees you may encounter areas that appear to be "stunted", but they are not, we had a tornado ravage the area in 2003 and this trail shows the clear evidence of the tornado's path. This is a perfect way to teach the destructive powers of a tornado, as the downed and twisted trees are still easily seen from the trail. 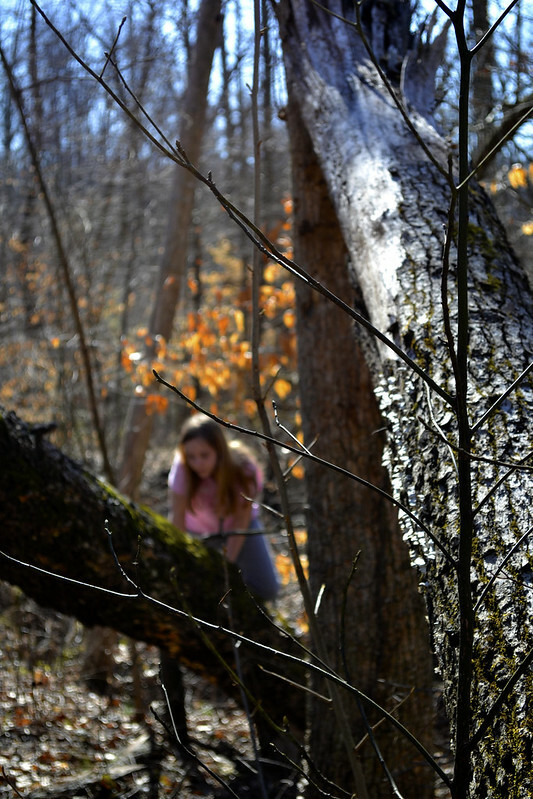 Of course for a child, these downed trees provide a perfect and fun opportunity to increase their climbing skills too! This damage is a great example of the resiliency of the forest when taken care of. Now, for our family this was a pretty long hike and in order to spice up the nature for my then ten-year-old, we decided to search for a few geocaches while out on the trail. 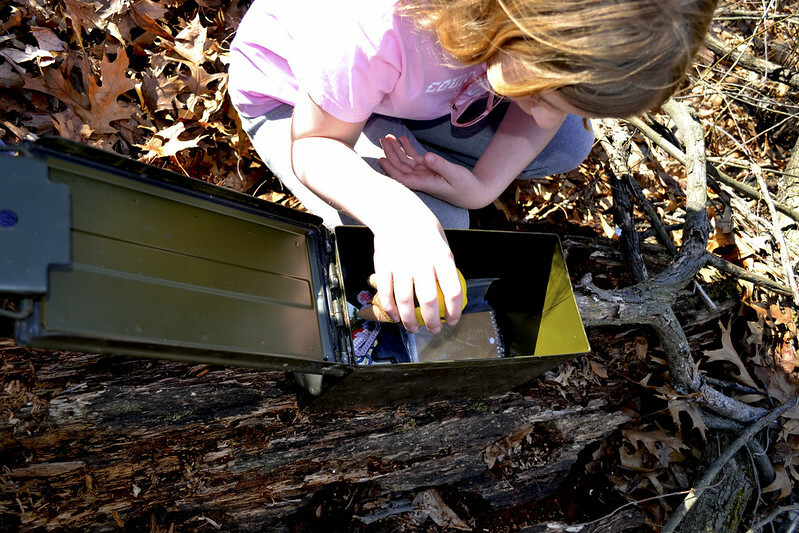 If you are unfamiliar with geocaching, or think I just made it up, head over to Geocaching-The Official Global GPS Cache Hunt Site for all the information you could ever want, and a quick and easy look up for geocaches near you or your prospective hikes. For our hunt, we simply took our car GPS unit into the field with us and used the coordinate look-up function to place the marker on our screen, of course your unit may be entirely different, but the fact is, we didn't need a fancy pants hand held unit and nearly all smart phones have a GPS function built in and numerous apps are available for you to use, such as the Geocaching Toolkit, I have used this one myself so I can vouch for it. Keep in mind, there is a Geocacher's Code of Ethics and be sure to bring along something to trade for an item that you may find interesting, be sure to read where others who have come before you are from, it is interesting to find so many others who found your little "secret" stash! Another quick note as you look over the geocache entries, a "Muggle" is someone that isn't out to find a geocache or someone unaware of geocaching even exists, I'm not a big fan of the Harry Potter series and it took me a bit to figure out what the heck a muggle was. The West Loop has a few creek crossings as well, Indian Creek is prone to flooding its banks and flash flooding is always a possibility during rain storms, so please be careful as you cross these areas. As with any area rich in water and cover, there is a great chance to spot wildlife on both trails, keep an eye out for turkey, whitetail deer, foxes, fat little squirrels and more. Concerning the squirrels, keep an eye on the sky, as we were convinced that one particularly fat little bugger was chucking branches and nuts at us, funny till you catch one on the noggin. You may notice on the Peewah Trail Map that the West Loop is nearly bisected by trail that leads to a backpack camp located dead center of the loop. We did not explore this camp, but I can assure you, we fully plan to! In fact, we hope to use this as a refresher before taking on some longer backpacking trips this fall and next spring, so stay tuned for more information as we experience it. Overall both trails offer fantastic hiking, well maintained and clearly marked trails (provided you know what you are looking for, so please print out a map), some breathtaking views and scenic spaces. 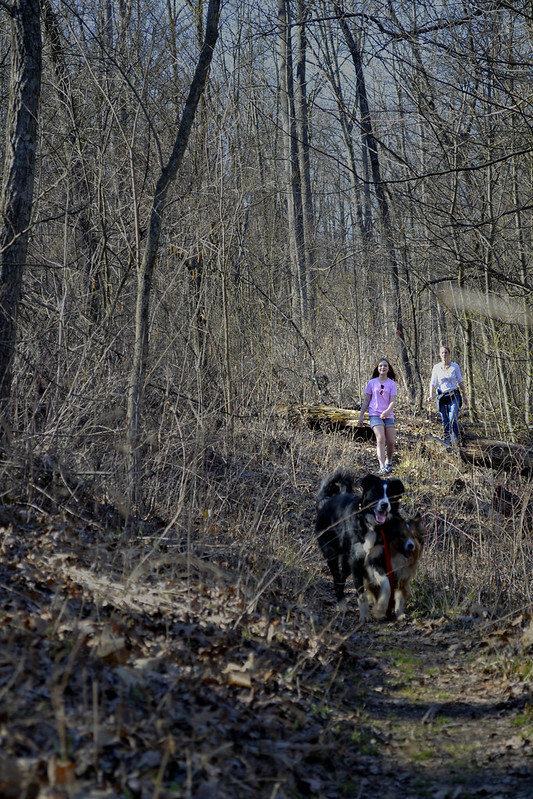 We only encountered one other group of people out on the trail, another family, and immediately after they were out of earshot we were instantly transferred back into the solitude and serenity of the wild acres. 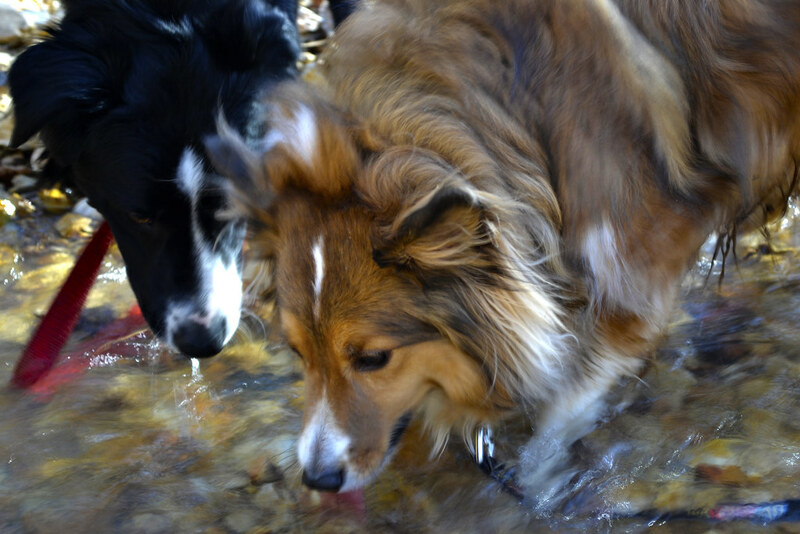 The boys enjoyed all the smells and nature along the trail, while we enjoyed the family togetherness you can only experience on a hike. Even though we went during the late fall/early winter period there was still PLENTY to see and take note of, however, this trail would be truly breathtaking in early fall as the leaves change and the bottom-lands truly come alive in the early spring with a plethora of local wildflowers in full bloom at that time. I certainly hope you'll make time to explore at least one of the two loops available on the Peewah Trail, I'm sure you'll find it just as enjoyable as we did. As always thank you for reading and let me know if you have any questions on the trail. If you dig the blog be sure to give it a +1 up there or subscribe with your email address up top, it won't bug you until the next update then. Happy trails till next!